Ambitious pan-Asian fare from restaurateur Stephen Starr and chef Peter Serpico. : Philadelphia restaurateur Stephen Starr first made his name in the '80s as a music promoter with a South Street venue called the Ripley Music Hall. 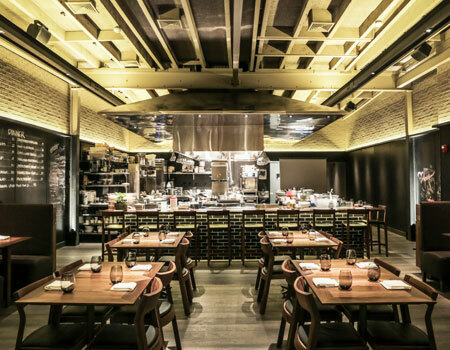 Now Starr has returned to his roots, opening a pan-Asian restaurant next door to the place’s old location in partnership with chef Peter Serpico, the former culinary director at New York's famed Momofuku. The industrial chic space features black walls used as a chalkboard for the seasonally-changing menu, touches of exposed brick, a freestanding bar and a sprawling open kitchen with a chef's table. The self-contained room is very much its own world separate from the bustle of South Street, all the better for Serpico and company to transport you to new culinary destinations. The small but ambitious menu is organized from lightest dish to most heavy, and they can be shared or not. Raw fluke is a standout, in a soy dressing made kicky with charred jalapeño. Chicken and snail lasagna with hazelnut pesto adds an Italian touch, while the homey deep-fried duck leg is served on a potato roll with pickles. For dessert, the Cope’s Corn Cheesecake offers a novel spin on the classic, with corn tempura and crème fraîche as accoutrement. Toasted apple cake is rustic and elegant, paired with a burnt apple sauce with caramel and brown butter, and vanilla ice cream. Well-trained staff, a constant in Starr restaurants, is adept at explaining the nuances of the menu, while the cocktail, beer and wine list highlights small-batch, craft brands.